Are you facing the following challenges in your Human Resource Management processes: manually managing employee information, processing payroll in spreadsheets or losing track of leave balances? Paperwork and lack of automation in Human Resource Management leads to inefficiencies, ineffectiveness, is costly and time consuming. Everyone shies away when they hear anything to do with paper. Searching through CV's take ages, calculating payroll elicits memories of calculus and managing leave manually is tedious. Well, SapamaHRM is here to help. SapamaHRM is a strategic investment. It allows your to do more for less. It saves you time and reduces administrative costs involved in employee profile management, payroll processing and leave management. SapamaHRM is a Cloud-based Human Resource Management Platform that simplifies the already complex HR processes. Since it is an online software and accessible from any location just like Gmail, you don't need to maintain expensive servers or incur costly upgrades every now and then. With SapamaHRM, you don't need to worry about the security of your data since information is safely, securely stored online and backed up for you on a daily basis. SapamaHRM uses Role-based Access Mechanism where your colleagues are assigned roles and can only access what they are authorized to. What's more, SapamaHRM enables you to be accountable by keeping an audit trail of who did what, at what time using which computer and browser. Do you have a pile of CV's at the corner of your office? Do you save your employees' information in drawers? SapamaHRM is here to help. SapamaHRM empowers you to digitally manage employee profile and bio-data, upload CV's and identification documents, record next of kin, dependents, education and work experience. SapamaHRM enables your to visualize you organizational structure by attaching your colleagues to pre-defined locations, departments, job categories, employment statuses or work shifts. Using the self-service portal, your colleagues can login, view and update their details. SapamaHRM not only enables you to easily track and keep all your colleagues personal information up-to-date but also makes information retrieval faster while at the same time keeping the office clean of paperwork thus saving the environment. Have you every paid your colleagues after 5th not due to lack of funds but because of the mathematical challenge of running the payroll? Or even worse, penalized for submitting statutory returns late? Holding other factors constant, timely payment of employee renumeration is a great motivator and result in better performance. Payroll processing can be an intense and daunting task with complicated calculations and formulas that remind you of Newton's Laws of Gravity and you wonder why he watched the apple fall down from the tree rather than eat it! You have to seal two or three days, just to get it right. Then, you'll need to issue payslips and subsequently submit statutory return on time. SapamaHRM payroll management has got you covered. It's a fully-pledged carefully crafted payroll module designed in consultation with industry experts to comply with the best HR practices. SapamaHRM enables you to set employees basic salary, custom deductions, allowances and benefits. You can process payroll for multiple colleagues on a click of a button, keep a record of your master roll, generate detailed professional pay-slips branded with your company logo. Furthermore, you can send the pay-slips to your colleagues individual emails right from the software. In the spirit of data democratization, your colleagues can sign in and view or print their pay slip, apply for salary advances and loans which will be automatically deducted in the subsequent payrolls. With SapamaHRM, you'll say good-bye to penalties as it easily generates for you ITAX, NHIF, and NSSF reports (byproducts) that are ready for submission enabling to comply with the labour regulations. Customer is king, but your employee is the new king and SapamaHRM enables you to pay your colleagues in time and keep the king happy! Have you ever lost track of your colleagues leave days? Do you need your colleagues supervisors to approve their sub-ordinates leave ? If leave application are handled manually, you can easily lose the paper trail. We all know that work without play makes Jack a dull boy and that your colleagues need to take sometime away once in a while. That said, there should be clear processes for taking leave to ensure business continuity. Leave all this to SapamaHRM. With SapamaHRM, you can specify leave types such as annual, study, maternity, paternity and compassionate. You then entitle your colleagues to a give leave type for a given leave period. Your colleagues login and apply for leave online. They can also delegate their duties to their colleagues who have to accept responsibilities and then the application proceeds to the supervisor or line manager for approval. After supervisors approval, it goes to the HR Manager who can view it in a calendar and detect any collusion before approval. For transparency and clarity, all parties involved are sent an email notification every time the application changes its status. SapamaHRM enables you to save your calculator's battery and automatically calculates for your leave balances and also carries forward leave days to the next period. With SapamaHRM, tracking, managing and approving employee leave become as Lionel Richie said “easy like Sunday Morning”. A journey of a thousand miles starts with one step. 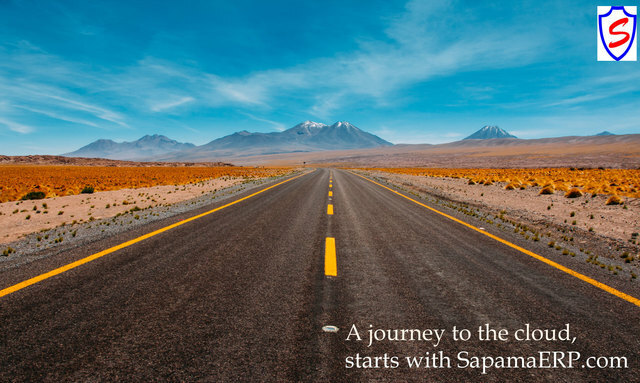 The first step to your HR transformational journey is our no-astericks free trial that enables you test and evaluate SapamaHRM usefulness to your organization. If it's value for money and saves you time, that's when you'll pay your affordable first-class ticket to simplifying, streamlining and automating your HR processes that comes with free phone and email support and also free upgrades and updates! Isn't this the best thing since sliced bread? Sapama ERP is a cloud-based Enterprise Resource Planning (ERP) software for small and medium sized organizations.